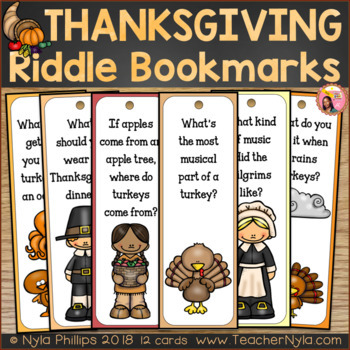 Here are a dozen funny Thanksgiving themed bookmarks. Each one has a riddle on the front and the answer on the back. Turkeys, Pilgrims, and other Thanksgiving elements are featured in this set. These bookmarks can be used as rewards to encourage your students to read. With this set, you get a color version as well as a duplicate set in black and white for students to color their bookmarks (that's 12 in color and 12 in black and white). I chose these these jokes with students in mind so they are suitable for your kids, positive, clean, and without bias. I wish you a great school year! I'd love for you to visit the Nyla's Crafty Teaching Blog!